The UVI Workstation has been updated to version 2.6.0. Through the weekend, Steinberg offers 40% off a selection of four of its instruments and tools. DiscoDSP has released the Beta 6 version of Bliss, its new sampler and VSTi host. 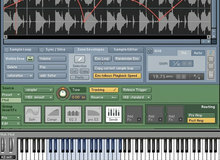 DiscoDSP has released the Beta 5 version of its sampler Bliss. George Reales released public beta 2 for his Bliss software sampler and synth, which adds many new features and improvements. George Reales has released the first public beta of Bliss, his new software sampler equipped with modulation, morphing, effects and more. Redux, Renoise’s new VST and AU plug-in, is a sampler and phrase sequencer for Mac OS X, Windows and Linux. Native Instruments has launched its now familiar Summer of Sound sale, with 50% off all Komplete and Maschine updates, upgrades and crossgrades. IK Multimedia called drummer Terry Bozzio and producer/engineer Alan Parsons to create to drum and piano libraries for SampleTank 3.
fisound releases PiAnnette, sample library for the sforzando player featuring the sound of a Horner Pianet T electric piano.